Stardate 2014: Recording good music in the heart of the Middle East with Bill Laswell and James Dellatacoma. Tel Aviv, Israel. Everything is going according to plan. First time for your reporter in the recording studio with Laswell since working with O Rappa in Rio de Janerio circa 1998. Time to get serious. The band, Yemen Blues, is really good. Most of them aren't from Yemen nor do they play the blues, but that's besides the point. Lead singer/lyricist Ravid Kahalani is a Yemenite whose family transplanted to Israel not long before he was born. He carries the tradition and culture of his ancestry expressing it in World Music. He also signifies a Middle Eastern artist culture you don't hear about much in the mainstream media. People fed up with politics and fighting finding other solutions. Creative solutions. Ravid used to work as a gourmet chef. He takes us out to the 5 star restaurant where he once ran the kitchen to celebrate the successful conclusion of the sessions. Nearly an entire album recorded in 4 days. Non-stop work, though if you love what you do, the work turns into play. You don't work music, you play it. The restaurant's panoramic view through full length glass windows looks out upon the Mediterranean Sea. Best food I've had in Israel. It's there that Bill, upon questioning, reveals an amazing music story, one of the best I've heard because it ended up drastically changing my life, and likely many others as well. The time he met Brian Eno. Had to wait 26 years and fly to Israel to find the moment to ask the right question. We'll get there. The trip started on a rocky note due to a missed flight connection delaying my arrival by a day. Stringent questioning by Israeli border guards - entering Israel to record Yemen Blues seemed to raise alarms - marked another obstacle to cross. I showed them a sigil to describe my work in Israel recently given to me by Yoko Yamabe, Bill's production assistant, who designed it based on Austin Osman Spare's Language of Desire. Just in time for this trip. Despite it, or because of it, not sure which, they let me through. It appears incredibly, intuitively accurate. No one to meet me after customs that I could see. Walked around, waited for only 10 minutes or so then spied a rotund gent near a distant exit with a sign that had the same name as the one in my passport. What a coincidence, I thought, have to see what that's all about. I identified myself then mentioned Yemen Blues. That did not ring a bell. He showed the sign again which read "Oswald Fritz" and asked if I was sure that was me. His face did look a little like the hookah smoking caterpillar out of Alice in Wonderland, so I answered that I was pretty sure that's who I was when I woke up this morning but had changed so much since then that I wasn't certain about it now. After all, I'd been traveling for going on 46 hours by now, and was just going by memory. I pulled out my passport, the names matched, he made a phone call that registered approval, and we headed out through exit 23 to the car. As we pulled out, I asked him where he was taking me. Wasn't sure if we were going to the hotel first or directly to the studio. The session started at 10 am, the clock read 10:05; I hate being late except for my own funeral. The driver chuckled and said, "we're going to the hotel, don't worry you're not getting kidnapped." Terrorism jokes at the airport from someone I've never met before always crack me up. Welcome to Israel. Cleaned up quickly at the hotel then called Ravid who who sent the band's Production Manager, Noga Majar, to get me in a cab. A 15 minute drive brought us to Kicha Studios located in an industrial, funkier part of town. Later, sharing the Ancient Egyptian's and C.G. Jung's respect for the power of names, I asked how the studio got its name, what did it mean? Studio assistant Daniel Motolola didn't know, he thought it got named after someone's pet dog, and that it meant a prison in Russian. The austere, greyish-beige walls of the poorly lit stairwell - it was a 3 floor walk up - did suggest the ambience of a prison in its exterior as did the compartmentalized, multiple rooms, multiple doors of the interior. Every room except the entrance had double doors. to go from the lounge to the control room required negotiating 6 heavy glass doors, some with handles falling off. Going through all the doors to the Control Room reminded me of the opening sequence of the old Get Smart TV show. However, I never experienced a sense of confinement or lack of freedom you would expect in a prison. The music opened up aesthetic spaces that transcended the institutional-like environment much like the creative arts that can transcend the high-security, contentious environment of Israel and Palestine. I arrived around 12:30pm. Bill and James had scoped out the studio the day before and had come up with a game plan. All the mics were in place, most of the sound check had been done. James gave me a tour of the room and microphone set up. I fully agreed with most of the mics he selected - not surprising as we both had trained under Laswell's long time, rock solid engineer, Bob Musso with additional input from the mad genius of recording, Jason Corsaro. The moderate size Control Room, a box-like space with acoustic diffusors (parallel surfaces are anathema to a smooth frequency response) resided in one corner of the studio. The front and right walls had double glass windows running the entire width giving excellent visual contact to the 4 isolated recording areas they looked out upon. The mixing board, a vintage Harrison desk had a warm, punchy sound. It fed Pro Tools HD converters using v.8 software in a MacPro intel tower. Outboard we used included "Signal" tube mic pres, Tube Tech, Urei LA 3A, 1176, compressors and a couple of esoteric tube limiting amplifiers, all stereo. I brought a Kosmos subharmonic synthesizer to help with the bass sound. The Control Room has a small square window that looks out to a view of rows upon rows of corrugated metal roofing. It reminds me of a ships cabin window. Outside sounds sometimes filter in - jack hammers, air pressure hoses, drills, sirens, dogs barking, traffic - the ambience of working class Israeli life. The first two days was dedicated to getting all the rhythm section tracks; the whole band, except the keyboardist, played live for reference tracks and to give cues. Drumming and percussion, both playing and arranging was handled by a pair of very talented and experienced musicians, Rony Iwryn and Itamar Doari. These guys are percussion scientists that know how to play. Grooves locked to the tempo with great syncopated feeling. They have a World Music percussion synergy comparable in cohesion to the guitar intertwinings of Keith Richards and Ron Wood. Two voices musically fusing into one dynamic entity. Ginger Baker and Aiyb Djieng formed a rhythm combo that did this on the Material tour of Japan in 1992. I remember after the first show they played together in Tokyo backstage they congratulated and praised each other like long lost brothers. Itamar and Rony reminded me of that ... the brotherhood of percussion. Their percussion instruments included: a surdo - a big bass drum played with a mallet, the national instrument of Yemen, doholla - a special type of dumbek, kalabash - a hollowed out gourd that produces a bass drum sound, LP congas, sogo - an African conga, tan tan - like a high pitched conga, bombo leguero - a drum in the lower tom range lined with sheepskin and played with a mallet, cashishi - a shaker, shereke - another African shaker made from a dried gourd with beads affixed to it. There were various cymbals and bells. One of the metal sounds they played is called a torpedo, Another is just known as "tin" - basically an L-shaped large tin can with a low frequency resonator chamber on the bottom end; it gave both the percussive metal clang and a much lower harmonic. There was no trap set. The drummers set up side by side in the room with the liveliest acoustics located to the far right of the control room. Three of the walls is this smallish box room were brick, the fourth was glass doors and windows. The floor was wood, don't know what kind, pine or cedar, with throw rugs on it, The room had a nice, clear sound. It could have been a little more lively sounding for my taste. I used an old trick of putting room mics high up in the corners focusing away from the instruments toward the walls to capture maximum reflections. Bassist Shanir Ezra Blumenkranz was positioned in front of the drum room, his bass amp just outside in the hallway for isolation. James set up direct lines both pre and post his bass pedal effects to allow balancing options later. The pre effects DI ( direct injection) channel had an auxiliary send feeding the Kosmos. The bass cabinet, miced with a Beyer ribbon mic gave us 4 bass tracks all together. Shanir didn't have his regular Fender bass due to touring restrictions, but brought a Dan Electro which we were able to get an amazingly deep sound out of with help from the Kosmos. Shanir alternated the bass with an electric oud recorded with the same 4 lines. He also played a gimbri, the Gnawa bass, on one song. Incidentally, he has a great new album out with another project, Abraxas on John Zorn's Tzadik label. They cover Zorn's Masada Book Two. Recorded and mixed by James, it's clear, punchy, articulate, well played prog rock. Ravid sang and played gimbri in an isolated room to the left of the bass area. The gimbri was miced with a U67 and run direct. Horn arranger Itamar Borochov played reference horn parts on the trumpet in another isolated chamber behind the vocal room. Glass walls on both sides afforded visual contact with him through the vocal room. Boro had brought his own mic, an AEA ribbon, a great sounding mic on the trumpet. Had the same vibe as an old RCA. Jumping into this session already in motion, my brain felt at half speed compared to the pace of flow. I balanced and panned the monitor mix in Pro Tools, worked on some of the drum and bass sounds, changed and repositioned the drum room mics, and set up the Kosmos as my brain started to focus on the new board, outboard, monitoring, and the fast North African rhythm they were playing. The first song's working title was Gimbri Fast and probably is the fastest track we recorded. It became quickly obvious to me that Bill and James had a high paced, established dynamic and system of communication with each other. I wasn't exactly sure how to integrate so when we had a second I took James aside and asked how he worked with Bob Musso in New York. Bill, Bob and James have been a consistently working production team for years, something like 16. I figured I would play the Bob Musso position. Big shoes to fill, but my feet are always growing from all the food and vitamins I take in - 'remember what the dormouse said, feed your head' - it affects your feet too. Bob was busy in New York recording his own music. He also was recently back from doing some mixing at the Super Bowl. James became the primary Pro Tools operator, the helmsman. He has an uncanny, almost photographic memory of non-standard song arrangements, and is a very fast editor. I mainly got the sounds, set control room monitoring and handled communications with the musicians. I was the Lieutenant Uhura on the bridge of that ship. Daniel, our assistant engineer, was as professional and on top of it as any assistant in New York, Los Angeles, London or Tokyo. Noga kept us fortified with snacks and water with platters of fresh pear slices, apple slices, dates, figs, apricots, almonds, pecans, homemade tahini, pita bread, feta cheese, swiss cheese, and a soft sour cheese, an Israeli specialty similar to cream cheese. The only major technical issue occurred when a 192 - a Pro Tools convertor, gave up the ghost. It started putting out strange digital noise, alien signals of some kind, after our lunch break. It took 2 - 3 hours to track down and resolve the issue, fortunately the studio had a replacement 192 that worked fine. All the gear sailed along finely after that, no more technical problems. We got all the drumming parts, and most of the bass, gimbri and oud for 9 songs in 2 long days. Right on schedule. The next day was shabbat and a day off. Shanir asked if I'd like to go to Jerusalem, to see the old town and the Western Wall of the Temple. I said, "yes, definitely." James and Bill were intohhh it. Ravid starting making some arrangements and promised to meet us at noon tomorrow. Going to the site where King Solomon built the Temple seemed just as important for my esoteric researches as going to Cairo to see Aleister Crowley's Stele of Revealing. It had nothing to do with religion. I suspected that the Temple wall would be a great place to experiment with psychometry, the science of receiving information through contact with ancient artifacts. Shabbat: the normally sedate breakfast room at the hotel is filled with families dressed for Synagogue. A nice feeling. I take a stroll on the beach and record the random rhythms of people bouncing balls to each other with wood paddles. The weather is beautiful, sunny but not too hot, this could be California, lots of people out doing various beach activities. I catch up on the Allen Ginsberg bio I'm reading, always looking for clues for becoming a writer. Ravid arrives shortly after noon with Shanir, two cars, and 3 other guides - Yossi Fine, his girlfriend Meytal, and a top Israeli music producer whose name also might be Ravid, we weren't ever formally introduced. Yossi also produces top Israeli groups. He's done a lot of work at a studio in Northern California where I recorded two albums with Tom Waits. We have at least one mutual musician friend, a singer named Deja. Small world. I suspect that Yossi and the producer Ravid volunteered in part - besides just being nice guys - to experience darshan with Bill Laswell. Bill is wearing a fine art t-shirt depicting Aleister Crowley showing his horns in a posture called Vir which indicates the Hierophant post. Bill and I ride in the back seat of Yossi and Meytal's car at first talking amongst ourselves about various music projects and people. Bill mentions introducing Chad Smith, the drummer for the Red Hot Chili Pepper's to the gimbri, and I guess to Moroccan music. Bill and Chad, and some other musicians recently recorded a progressive album with assistance from Jay Bulger who brought them together. I notice Meytal giving me a direct look like she's seeing through me - beyond appearances. I say hello. She says hello. We don't get introduced to each other until reaching Jerusalem's old city. Getting close to Jerusalem the conversation opens up to include all 4 of us. Yossi talks about some of his approaches to recording, and also about the Burning Man festival held every year in the Nevada desert. We compare notes about recording with portable 2 track devices. Yossi had brought the Grateful Dead's Mickey Hart to the Temple wall about 2 weeks before where they discreetly made a recording of some kind. Meytal says that the latest Chili Pepper's single, recently released, has drumming that sounds Moroccan to her and figures that's due to Bill's influence on Chad. Later, I ask Meytal if she is a musician. She replies no, but says they call her something, a word I don't remember, which means she has Big Ears. I can relate to that. She also recognized Shanir's playing on a single that's currently getting a lot of radio airplay in Israel. The entrance to the old city takes us into narrow passageways lined with merchants selling all kinds of things. Reminds me of Morocco but a bit more upscale. I see a t-shirt that shows the word Israel in a google search with a caption that reads, "did you mean Palestine?" Free speech seems alive and well. Not really any interesting sounds, but market places are something I always record so I pull out my Tascam. As I do, some great sounding bells start ringing, different pitches in an unusual sequence sounding rich, and resonant with more lower frequencies than most bells. Right after the bells, these very serious looking priests dressed in black robes clear a way down the corridor with the one in front stomping a large black staff as he walks. They are Greek Orthodox. Yossi tells the story of the Greek Orthodox bishop who did something the Church didn't like so (pointing up) he's been locked up in one of those apartments for years and years. People put food for him in a basket which he pulls up with a rope. I'm on a mission to buy beads for a friend who makes jewelry. Meytal sees me negotiating with a merchant and steps in to get a much better deal. I ask what her name means, She gives an explanation saying it's a combination of cultures, French and Moroccan, I think, but that it essentially means 'God's dew.' Very appropriate name as I discover later. God's dew gets described in Crowley's Book of Lies, chapter 18, Dewdrops. Meytal, an Israeli from a small town whose heritage is 3/4s Morrocan, 1/4 French, has a degree in communications and once had a high administrative position for all of the Hilton hotels in Israel. After 4 years she realized that corporate life wasn't for her and now manages a tennis club working with many children. At lunch, she pursues a line of questioning that leads to her making a suggestion that strikes to the core of my being, something no one had ever mentioned to me before except for an African shaman in Mali who was reading off of some oracular shells. I conclude Meytal is either incredibly intuitive or psychic or Coincidence Control is working overtime. After lunch we go down the hill to the Western Wall that marks the border of the old Temple site. It being Shabbat there are a lot of people, most of them Orthodox Jews chanting, praying and rocking in a forward bowing motion to get the feeling of God inside their bodies. There are soldiers with submachine guns walking about looking relaxed. Because of Shabbat, it's not allowed to take pictures or record with any device. On any other day it would be fine. Yossi says I can record by keeping the recorder out of sight so I put it under my sweater. That's what he did with Mickey Hart here a couple of weeks ago. I asked Ravid it it was ok to get close to the wall and touch it. That was fine. Saw small pieces of paper rolled up and put into crevices, some kind of magic no doubt. I put my right hand on the wall for about 10 minutes and diffuse the vision. Focussed on connecting with King Solomon's Temple. Almost immediately I felt a tremendous force of energy from far away. 'Saw" what can get described as some kind of huge "battery" coming from great depths below. Did have a clear vision of a completely non-human, technological, if you can call it that, kind of space. Saw nothing remotely anthropomorphic, or any kind of familiar iconography, religious, or otherwise. I was recording the whole time but haven't heard the playback yet. Walked around the spacious square recording various groups of worshippers doing their thing. A group of young men loudly chanting Hebrew holding hands in a circle and dancing around. Ornate scroll holders recalling Egyptian Steles, probably holding the Torah, rapidly intoning soft chanting prayers. Went and attempted psychometry on the Wall again, this time a little longer. Didn't feel the same energy source, or have as deep and clear a vision - the first hit is free - but did have an interesting "voyage," what we call a journey of awareness and attention through alternate spaces. I did feel interference, opposition of some kind. Maybe related to the conflicts over these sacred sites. Ravid and Shanir pointed out later that this location marked the source of all the religious conflict. The interference felt like excessive yang to me, too much male, not enough female influence. Noticed then that it was all men here, men and women were segregated by a partition. Followed Ravid into a large arched room to our left, lots of people praying all dressed in black, altars and scrolls. He said that just below us existed an intricate series of tunnels which one could get a tour of. Dusk now, starting to get dark. We head to the far right side of the square to a walking bridge that goes to the Moslem side where the Dome of the Rock that contains the Foundation Stone is located. Everyone looks altered, mellow, outside the common. Time seems slower and elongated to me. I remember a similar mood when visiting some sacred sites in Uzbekistan when on The Flying Mijinko tour with Akira Sakata. The bridge is closed. Shanir thought it would be, but wanted to try anyway. We start back up the hill through the market to go back home. I find a few more beads on the way. Back in Tel Aviv, Bill asks about an African part of town he'd heard about. It's a favorite spot for Yossi and right on the way. We stop and walk through the area; reminds me of Dakar. This trip begins to feel like an extension of the Morocco trip, like somehow that trip helped make this one possible. Recording the gimbri, walking through the Moroccan style market - discovering later that this had been the Moroccan quarter for over 770 years before it got bulldozed after the war in 1967; our guide, Meytal, is 3/4 Moroccan, she hears a Moroccan influence in the drumming of Bill's friend Chad Smith. 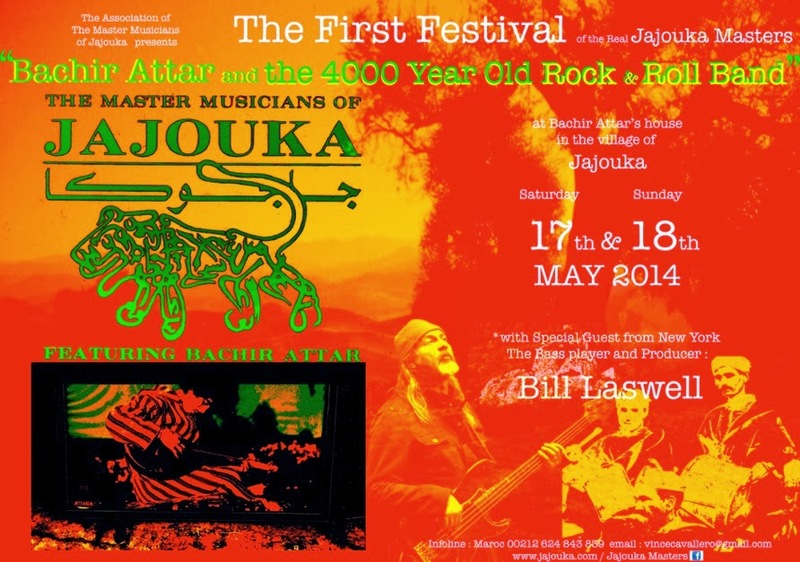 So in that spirit I'll interrupt this account to announce the upcoming festival in Morocco with Bachir Attar and The Master Musicians of Jajouka in Jajouka featuring Bill Laswell on May 17th and 18th this year. Back in the studio on Sunday we started by finishing all the bass and oud parts with Shanir. Next came keyboard overdubs courtsey of Hod "Space" Moshonov. Bill had told him to think space for one of the parts. Hod told us then that Space was his middle name. Hod, shares his name with the 8th Sephiroth on the Tree of Life where all the Gods of Communication hang out. Mercury, Lt. Uhuru and the electric switchboard gang. Hod got most of his synth patches from a later model Nord synthesizer He also had an instrument someone called a Kitar, a keyboard played like a guitar that offered a wide variety of "cheese." Herbie Hancock and George Duke used to play these; George called his a "Dukie stick." Hod laid his parts down quickly with alacrity and finesse. He played very well adding depth, dimension and atmospheric textures to the music. After a few hours Hod took a break to allow for vocal, then string overdubs from two lovely ladies named Hela and Karen playing cello and violin respectively. Doubling their parts produced a string quartet effect. Later, Boro put down his trumpet solos invoking the spirit of Miles Davis into his soulful statements. All the keyboard parts were finished the next morning. Several hours then went into horn section overdubs with Boro on trumpet, a tenor sax, and a trombone. Parts were doubled, sometimes tripled, and some arrangement editing was done on the spot. We finished the evening with Ravid's vocals. The entire album had been recorded in 4 days with the exception of 4 vocal tracks and an Egyptian string orchestra for one song. Two of those vocal tracks still required the lyrics to be written. Everyone was in a tired, but celebratory mood at the end. Ravid arranged for a good meal at a gourmet restaurant on the Mediterranean. At dinner conversation turned to Martin Bisi's legendary BC recording studio in the Gowanus section of Brooklyn, NY where a lot of classic punk and alternative music had been recorded. Bill mentioned that he was with Martin the day he found that space and ended up living there. The neighborhood was so rough at the time that he got robbed nearly every time he went home but convinced them not to take his bass because that's how he earned the money they took. Bill's solution was to bring Afrika Bambaataa around the neighborhood to talk to the kids who left him alone after that. I had heard that Brian Eno helped finance the studio, originally known as OAO for Operation All Out, a Burroughs acronym from Naked Lunch. Bill said that Eno had bought the mixing board. The first recordings there became Eno's 4th in his ambient music series, On Land. I asked Bill how he met Eno. He said that one day he walked out of his apartment on 8th Street, across from Electric Lady recording studio and saw Eno talking to Hassan Heiserman. Hassan was carrying a script based on the Burroughs book, The Ticket that Exploded trying to interest Eno in the project. Bill gave Eno his contact information who soon went on his way. Hassan and Bill struck up a conversation beginning a long association together. Hassan personally knew and worked with a wide variety of counter-cultural icons, everyone from Kerouac and Ginsberg to Robert Anton Wilson, Tim Leary and E.J. Gold. He introduced Bill to Ornette Coleman beginning another lifelong friendship and important musical contact. I wrote about Hassan HERE. In my last blog, Marrakech, I brought up the idea of "power spots," certain locations where extraordinary events occur. The example I used was Jimi Hendrix's Electric Lady recording studio built on the same location as a bar where Gurdjieff and Buckminster Fuller met and had long discussions. I had been reminded of that coincidence recently when E.J. Gold told a story about a place he went to right across from where Electric Lady was built. Consequently, it felt quite astonishing to hear Bill tell this account of meeting Hassan and Eno at that same location. Bill's first session with Eno was My Life in the Bush of Ghosts, the album that persuaded me to become a recording engineer after I swore to never do that. Hassan was one of the reasons I moved to California as described in the link. The Ticket that Exploded describes some of Burroughs' tape recorder magick experiments that strongly influenced me. Three people who profoundly altered the course of my life chanced to meet for a brief moment on 8th Street in New York across from Electric Lady. That meeting profoundly affected each of their lives too, and who knows how many others. Bill and James left for the airport early the next morning at 6:30 am. I had until 8pm before going. Spent the day catching up on business and writing. Looking out the window upon the row of high rise seaside hotels and the Mediterranean, I reflected that the Marina Hotel had been a good place to establish a temporary High Velocity World Headquarters. Watching the western horizon rise to meet the setting sun I decide to take a break for a walk by the sea. I strolled out on the marina's rock fortified walkway that went out over the water. The wind was blowing strongly sending waves crashing against the rocks spraying me with salt water at one point. Took the opportunity to invoke the forces of the Sea. Turned out to be very effective. I felt the coolness of water all the way home. It occurred to me that the idea of walking on water symbolizes riding on top of powerful forces of nature. This idea also resonates with the contemporary Thelemic attitude as shown in psalm 93. Merkel: Reaching two-state solution is 'part and parcel' of securing Israel's future. Netanyahu says Israel wants a 'real peace' that ends the conflict and gets Palestinians to recognize the Jewish state. Obviously you've got to recognize them if you want them to recognize you. Whoever puts together the Post's headlines figured that out. Netanyahu was at the White House yesterday meeting Obama for further peace discussions. Let's do it. Music played while writing this report was Bernie Worrell's Elevation - The Upper Air, solo piano renditions of some classic jazz pieces, and original compositions. The first track is In A Silent Way, the last one is Redemption Song. Produced by Bill Laswell and recorded by Jason Corsaro.